The Big Drop, Jagged Roost (UP) – Police and Mechanicum personnel were attacked in a violent gunfight that left three dead on Saturday in the area of the Jagged Roost called the Big Drop, said Adeptus Arbites sources. 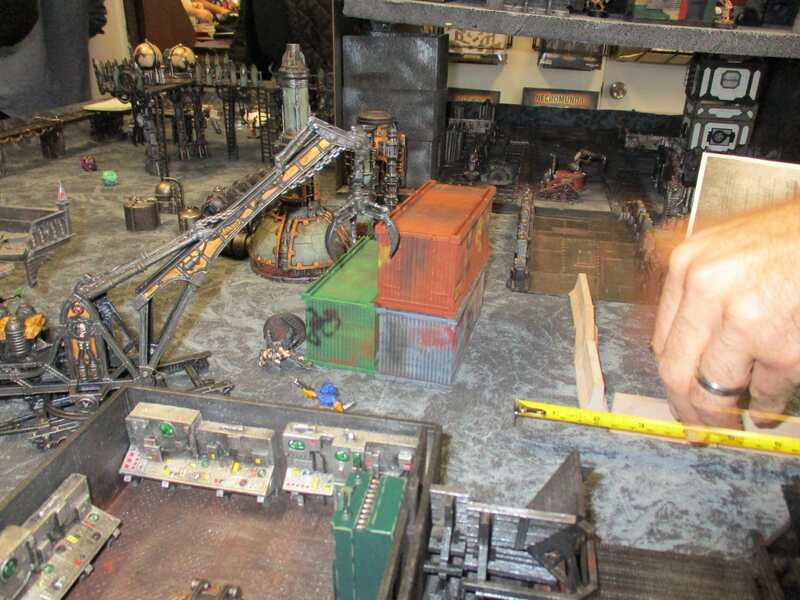 Mechanicum Biologist Crison Watck was injured in the fighting which eye witnesses involved gangs from at least four major houses. 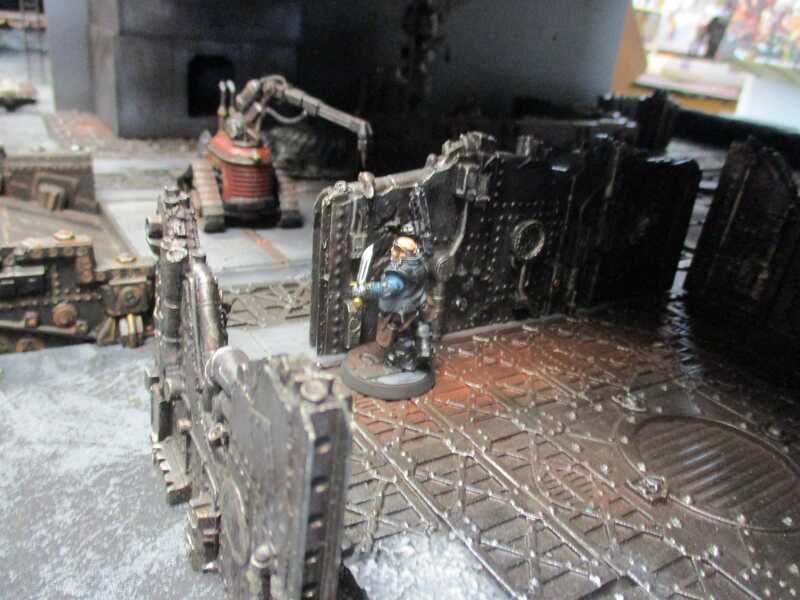 Adeptus Arbite officers were fired upon as they escorted Watck through the Jagged Roost, said Lt. Clearchus Lysimachus. "The officers were not injured in the fight. I can't say the same about Crison Watck, unfortunately," Lysimachus said. The visit of Watck was for monitoring the stability of this hardest hit areas of the Jagged Roost in the recent hivequakes, Lysimachus said, although he would not say why a biologist was sent to investigate that problem rather than a member of the Seismographium. "We know there were members of houses Orlock, Goliath, Cawdor and Escher there, although we are not sure exactly which gangs were involved in the fighting," Lysimachus said. "Believe me, we are investigating and the Big Drop has now been cordoned off while we search for evidence," he said. Violence has become an increasingly common event in the Jagged Roost say many locals. "When I first moved here it warn't like this," said former Big Drop resident Philthy Lezruw. "In the old days, we didn't have this kind of trouble. I never thought when I built my dwelling here that I'd be moved out of this area like they just did," he said. When asked how long he had lived in the Jagged Roost Lezruw said he came in when the Arbites stopped preventing people from entering, about a month ago. Another former resident Layne Yelats reported that he saw at least three people killed in the fighting. "There was so much shooting going on it was tough to keep track of where it was all happening or who was shooting at who," he said. Yelats said, "After the shooting stopped I went down to see things for myself and even in the dark you could see pools of blood. I know that three of those girls that came in did not walk away from here under their own power." "I went around to some of the docs I know here and there were three bodies outside one of the surgeries covered in a tarp. I had me a little peak while no one was looking and saw that they was Eschers," he said. Mechanicum offical Nala Nurting said "01010100 01101000 01101001 01110011 00100000 01110011 01101100 01101001 01100111 01101000 01110100 00100000 01110100 01101111 00100000 01101001 01101101 01110000 01100101 01110010 01101001 01100001 01101100 00100000 01100001 01110101 01110100 01101000 01101111 01110010 01101001 01110100 01111001 00100000 01110111 01101001 01101100 01101100 00100000 01100010 01100101 00100000 01100001 01110110 01100101 01101110 01100111 01100101 01100100 00101110 00100000 00100000"
Inquiries to the named houses have not been returned. 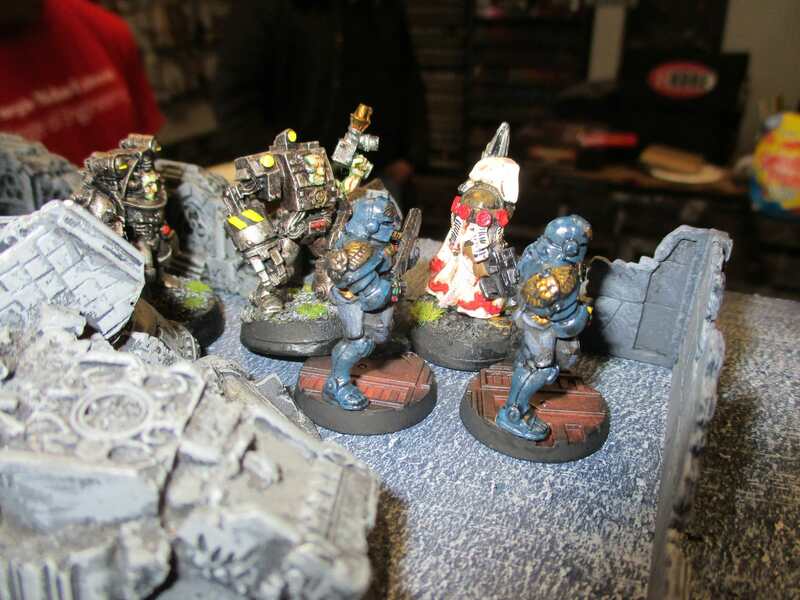 This cycle the assault on the Imperial Agents did not go unnoticed and the gangers will have to keep their heads down. Patrols of the areas of violence have been stopped and instead the Arbites are looking into anyone exhibiting unusual injuries or illnesses. As a result of this every known medicae in the area has an officer stationed at their surgery. The result of this is that if you need to take a ganger to the doc's for fixing up after a particularly bloody battle the usual rules apply as far as getting them healed but immediately after they are healed they are taken into captivity by the Arbites. So is the ganger that brought them to the surgery unless they can pass an I check. Any ganger arrested in this way can be ransomed with a series of bribes and legitimate payments for half of the start cost of the model plus half the cost of any equipment they have. 2. "Huh, I feel a little weird." Roll a d6, if it is > the models CURRENT toughness then report the results to me. 4. "Ma, you on uppers? "Make an immediate serious injury roll, if it is an out of action or serious injury result apply that result. 5. "I'm from Buenos Aires and I say kill 'em all!" The model is gripped with terrors and shoots at the nearest model, friend or foe, and doesn't move, for the rest of the game or suffering a serious injury. The model will not become pinned or run. 6. "Sam is acting strangely" The model follows the movement rules for sentries. If a double is rolled though a large blast marker is placed over the affected model. The model is ripped apart as strange biological material spread out from him or her. Any model under the template takes a S check on 2D6 (!) and any that do not pass are stuck under the strange, muscular tissue for the rest of the game. They can be shot at as normal. Anyone attempting to free a model or coup de grace them must pass a cool check before stepping on the weird biological material. To free a model you must inflict 2 wounds against a T5. 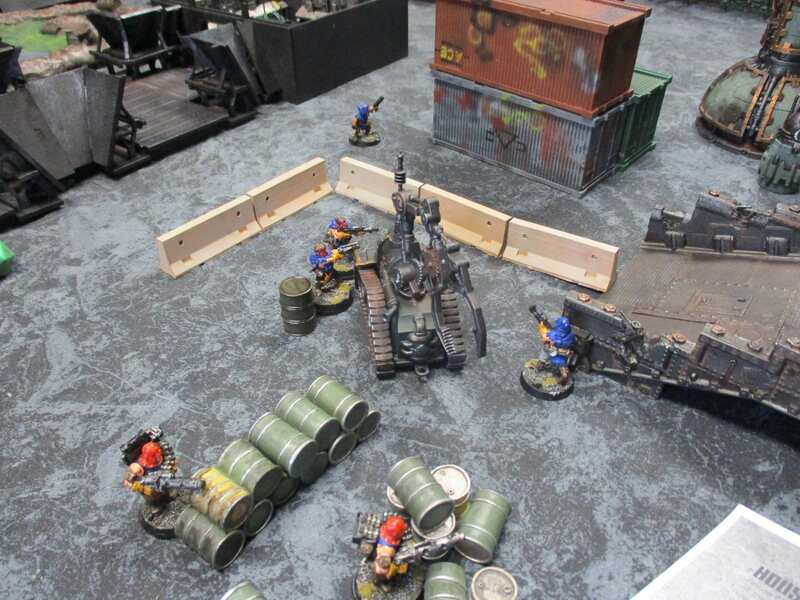 A model is hit by a chem thrower wielded a member of the Skulz'n'Roses gang. 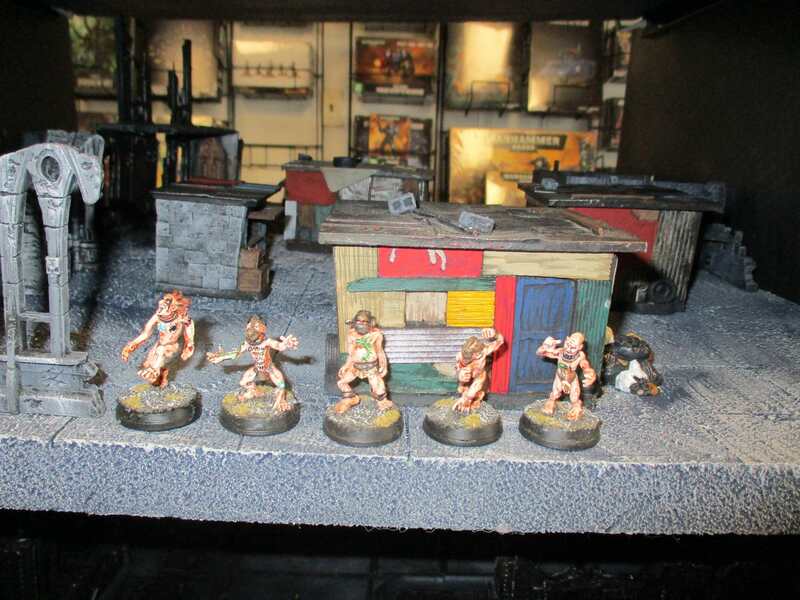 A model is hit and wounded by a stiletto wielded by a model in the Skulz'n'Roses gang. A model in the Skulz'n'Roses gang uses any weapon with the toxin or gas special rule and fails an Initiative check. These rules apply until the end of our next campaign day. Thanks for a great report! Very amusing! Nice write up. I think I figured out what caused the seismic disturbance: Third image from the top, opposite the crane. There seems to be either a line of four oddly shaped xeno's connected at their heads, or a biological vehicle of some sort. Definitely doesn't belong in the under hive and needs investigating. To be fair the biologist, or at least his crew, shot first. One of the Arbites shot a ganger in his back with a shot gun from less than 10 feet away as soon as they saw him. 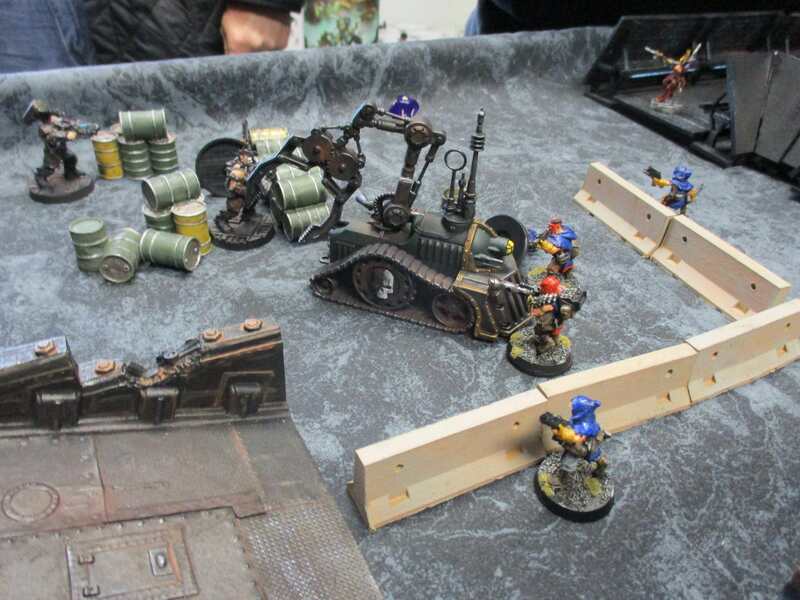 They gunned down quite a few other gangers in their movement across the table as well.